This versatile set of 4 clear mahjong pushers are perfect for matching with a stylish, contemporary case, or contrasting with a classical wooden or leather mahjong set. 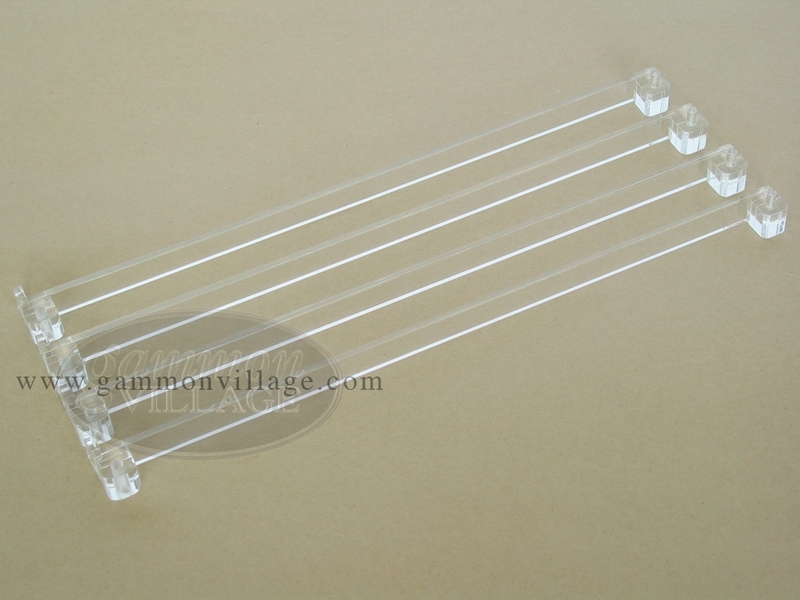 These mahjong pushers are robust and will hold up for a long time, due to their solid acrylic construction. Their length is eighteen inches, suitable for all standard sized mahjong racks. Simply attach the pusher to one peg of your money holder and effortlessly push out your wall of tiles, making sure nobody can see the tiles on your rack. Please click on the specifications tab (above) for more information about these mahjong pushers, or click on the photo to zoom in. Page P1599 Copyright © 1999-2019 GammonVillage Inc., USA. All rights reserved.